For the second time in my life, I have been given the grace to visit Marie-Julie Jahenny’s home. Again, in order to find it, I ask Marie-Julie to guide me there, as La Fraudais is a small hamlet tucked into farmland that is rolling and treed. Stepping onto the land of this shrine, there is a palpable peace which one feels immediately. This is truly a holy place, and one has the sense that the Angels are preserving it for the times after the devastating Chastisements. Saturday is the day to visit, the day when the shrine is open to visitors. Families and individuals come with picnic lunches. They come from all over France, to listen to the prophecies, and to discuss the prophetical events which are unfolding around them. Listening, each one of us also absorbs the atmosphere, having his or her own quiet visit with Marie-Julie. Afterwards, we take turns praying in her bedroom, the place where she spent years as a victim soul, bedridden, and where she had the heavenly apparitions warning us of what is to come. One can feel her presence here, and it is easy to imagine her lying in her bed, acknowledging each visitor. 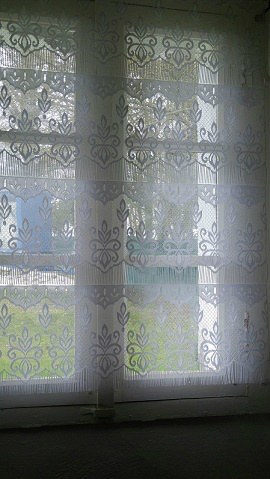 Again I am drawn to the bedroom window (photo above), with its simple and charming lace curtain, a typical Breton window covering. This window opens to the back field, the place where Marie-Julie has been photographed among flowers, her Crucifix in her hands. Here is the simplicity of Faith, the simplicity of a heart that lived in the presence of God. This is the life that mankind will return to after the Chastisements. God has told us that He will punish us to bring us back to Him. This modern world gets in the way of living a life with God and in God. After the Chastisements, there will be prayer, kindness, and people will help each other gladly. Yes, the Chastisements will be horrible enough to kill us with fright if we look upon them, and yes, they are coming; but let us see past them, to the peaceful life that we are promised, and which our souls are yearning for. Our souls want God; our souls want this peaceful life. I have seen this peace at the shrine, I have felt it. Believe me, it is worth waiting for! Sacred Hearts of Jesus and Mary, make our hearts like Thine!